Y Drive Limousine, We are The Party Bus People! CLICK HERE TO READ THE FAQ PAGE "YOUR QUESTIONS ANSWERED HERE"
It really will answer your questions! Click here to see pictures of our fleet in the photo gallery. Wedding Transportation , Bachelor and Bachelorette Parties, Birthday Parties, Ladies/Guys Night Out, Airport Transportation, Corporate Event Transportation, Concerts. If you need to get around... Y DRIVE? Let us do the driving for you! We ARE the Party Bus People! Our Calendar For Upcoming Events! In many cases, by buying group quantity tickets we can offer these tours including transportation at close to the cost you would pay for the admission only. Tours require a minimum of 15, 20, 30 or 40 passengers to register depending upon venue. If we do not get enough people to register for an event, that tour will be canceled. 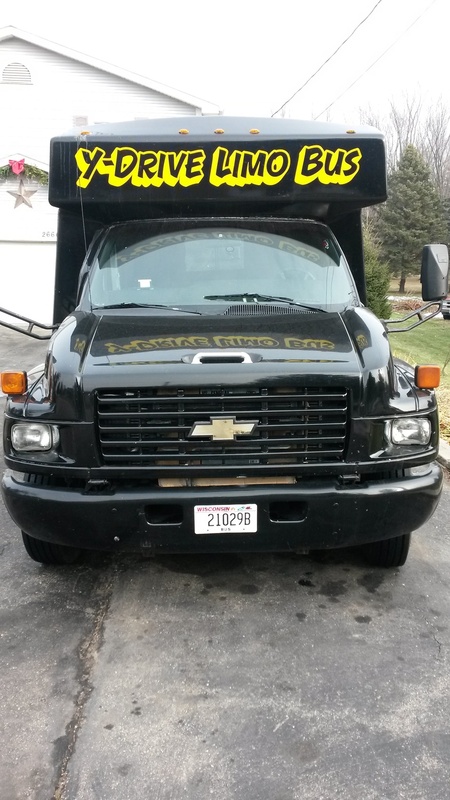 We use Delavan as our default departure location however we can have pick-ups in your community as long as we get at least 1/3 of the people for that event. Times will be adjusted accordingly. If you have a suggestion for a tour, please let us know and we will do our best to put it together for you!